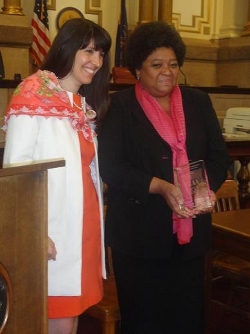 Awarding TLAA’s first ever Diversity Leadership Award to Charisse Lillie. My passion for greater diversity and inclusion, and my belief that more diverse and inclusive organizations function better, drove my work with the Temple Law Alumni Association. I am a former President of TLAA, the 4th woman to hold the presidency in the organization’s nearly 100 year history. 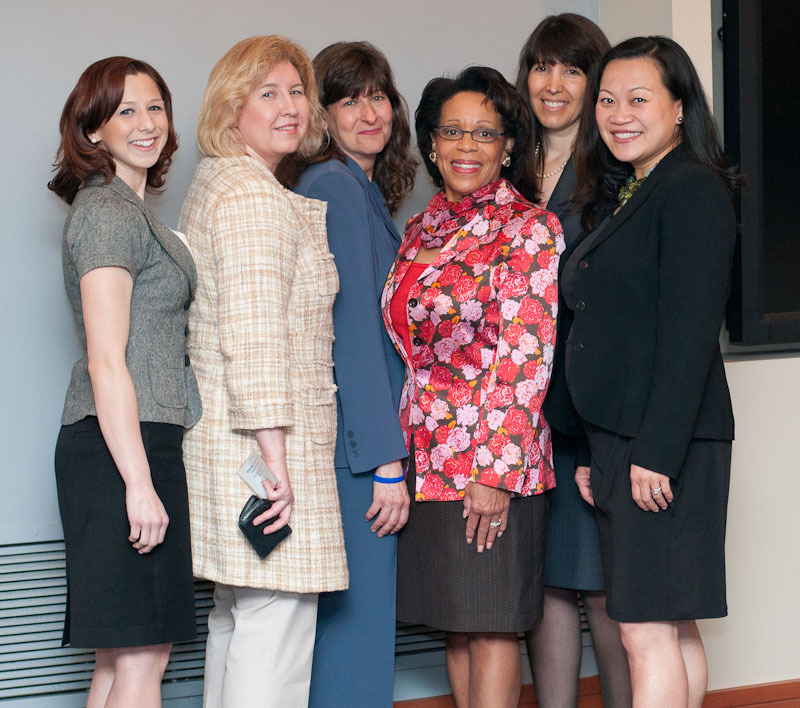 During my term as President, I founded both the TLAA Women’s Initiative and the TLAA Diversity Committee. I launched TLAA’s Women’s Initiative to help women succeed. “Backwards in Heels: a Panel of Women Lawyers Share Experiences and Strategies for Success,” was born of that goal. Temple Law Dean JoAnne Epps moderated the panel of female graduates from diverse fields. We gave the audience specific, concrete tips they can use to get ahead. Pictured in the middle photograph from the TLAA Women’s Initiative event, “Backwards in Heels” are, from left to right: event Co-Chair Vanessa McGrath, event Co-Chair and Large Law Firm Panelist Mairi Luce (a partner at Duane Morris LLP), Pro Bono and Criminal Law Attorney Panelist Marissa Boyers Bluestine (Executive Director of the Pennsylvania Innocence Project), moderator Temple Law Dean JoAnne Epps, myself as an event Co-Chair and Small Law Firm Panelist (in my roles as Founder of The Axelrod Firm and President of TLAA), and In-House Counsel Panelist Sophia Lee (then Chief Counsel of Litigation at Sunoco). In 2013, I founded the TLAA Women’s Champion Award which recognizes an outstanding Temple Law graduate who has demonstrated a commitment to the progress and equality of women in the legal profession, has been influential in leading other women lawyers on the path to success, and uses her position and influence to inspire, mentor, advance, promote, and encourage women to achieve excellence in the profession. In 2016, after my term as President of TLAA and a co-chair of the TLAA Women’s Initiative ended, I am honored to report that I was chosen to receive this wonderful award. Pictured in the top photograph is Ken Spivack, who was President of TLAA at the time, bestowing the award upon me. When I formed TLAA’s Diversity Committee, it was to help minorities succeed. 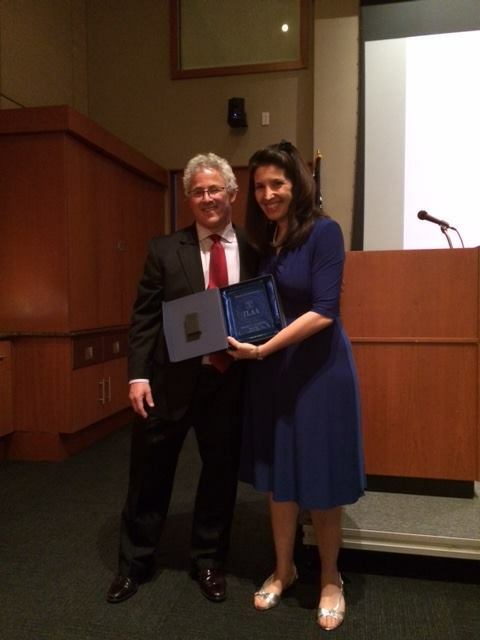 We launched TLAA’s first ever Diversity Committee Panel, and the TLAA Diversity Leadership Award. The award recognizes an outstanding Temple Law graduate who furthers diversity and inclusion in the profession with distinction. The first award winner was Charisse Lillie, the Vice President of Community Investment of Comcast Corporation and the President of Comcast Foundation, pictured in the bottom photograph receiving the award in 2012. These two committees have grown over the years. They and their awards, which continue to be bestowed on an annual basis by the TLAA Women’s Initiative (now known as the TLAA Women’s Leadership Initiative) and the TLAA Diversity Committee), are a legacy of which I am very proud.